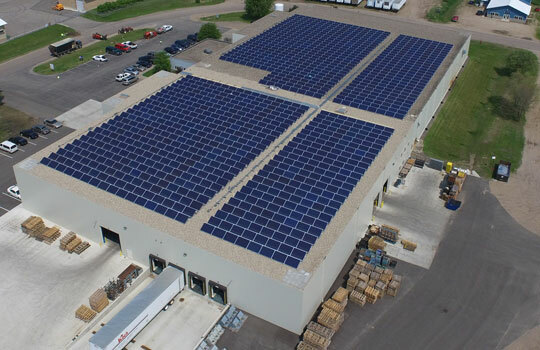 Louis Industries has one of Minnesota’s largest rooftop solar arrays. The family-owned steel manufacturing plant is using more than 1,200 solar panels to power its facility. New solar energy incentives made this an easy decision for a company committed to energy efficiency. IPS Solar supplied and installed the solar system. The Minnesota-made solar panels cover more than an acre, or 65,000 square feet, of roof space. The 498-kilowatt DC array will produce about 625,000-kilowatt hours per year. A long-time industry leader in steel, Louis Industries has worked to reduce its electricity bill while increasing its manufacturing process. By adding the solar array, Louis says he can reduce his $15,000 monthly electric bill by $5,000 each month.